What is a Sea-Monkey? – The Original Sea Monkeys The Original Sea Monkeys | What is a Sea-Monkey? You might well ask the question, 'What is a sea monkey®?'. Well, the sea monkey® (artemia nyos) is a relative of the brine shrimp (artemia salina), and looks like a very hairy version of a mosquito larva. These creatures will end up growing to about a quarter of an inch (about 0.6cm) in length. Sea-Monkeys® are the fun lovable little creatures that are too small to hug, but are highly enjoyable if you have a hard time raising pets that need to be fed on a regular basis. The great thing is that they are virtually maintenance-free pets; these little creatures are probably one of the easiest pets to raise, and come in a package so no worrying about them wetting themselves on the way to your very own home. Not to mention you can bring them to your office too without worrying about them leaving poo poo in the corner. In all actuality, Sea-Monkeys® are a sort of brine shrimp; in fact, they are actually hybrid brine shrimp. They have been engineered to live longer and grow larger. What fun would it be to have a pet that lives a month then dies? Brine shrimp are strong survivors. They have developed the ability to keep their eggs in suspended animation (cryptobiosis) for years. That means that if these little creatures' homes got all dried up for a couple years and then the rain finally gives them some swimming area, they can hatch and grow again doing their little flips and somersaults. 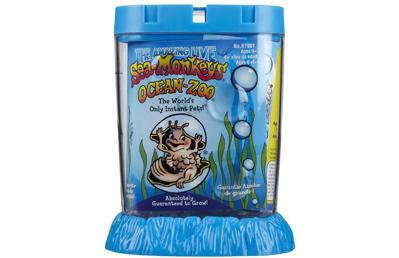 Sea-Monkeys® are sold the world over; their eggs are freeze dried, packaged, and then distributed to sea monkey vendors. Only this kind of shrimp could survive in those living conditions. They were very commonly used as live fish food because of their high protein value.